Our initial plan for this trip was to do the North and South Granite Ridge trails, but the conditions conspired against us. This was an exceptional winter and spring here in Nova Scotia, and you have to make do with what you’ve been given. For this trip, it was an evening start with freezing temperatures overnight followed by a long day of snowshoeing in sun and +10°C. Looking up at one of the popular climbing crags below the Admiral Lake loop. We were able to avoid wearing the snowshoes for the first couple of kilometers. Sure doesn’t look like spring. We had to don the snowshoes once we cleared the dog walker traffic. Looked like it was going to be slow going. It would just be the South Granite Ridge trail this time around. A beautiful spot to sleep. We were hoping to stay further inside the wilderness area but the soft snow underfoot had significantly slowed our progress. At 10pm beggars can’t be choosers. We hadn’t seen any sign of human traffic for a few kilometers and the packed snow made for a perfect minimal-impact tent site. There was a “trail closed” sign at the northern connector leading up to the South Granite Ridge Trail but nothing was posted when we had passed the southern entrance. Not sure what the sign was for. We rechecked the MTA website which listed all trails as, “no winter maintenance, use at own risk”. Onward and upward, on the unnamed connector trail heading for Kelly Junction. Made it to the top. We’d love to know the history and evolution of this trail system. 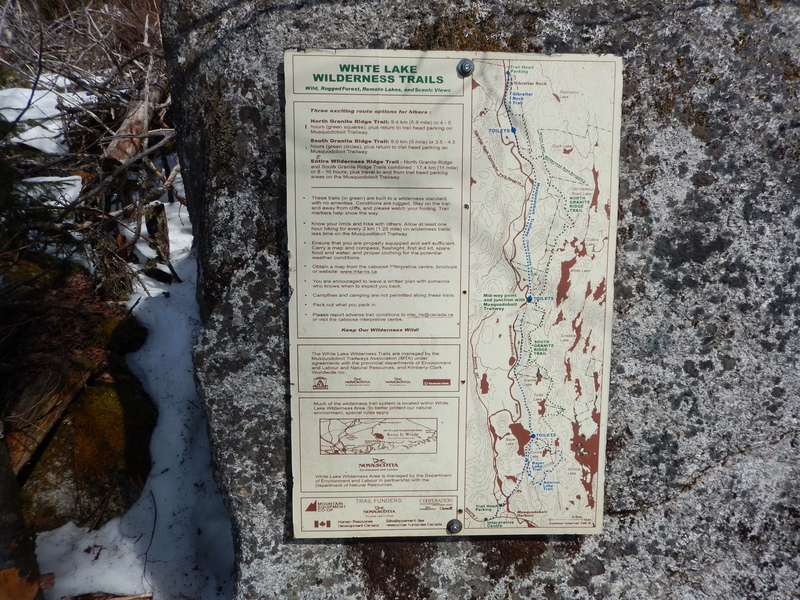 Some of the newer trail signs and map names don’t match the older ones (at least some of which are still also in place, and sometimes side by side). A mix of old and new signs. Heading up to Clearview look off. It was hard to believe that there was still so much snow even in completely exposed sections. Bushwhacking and deadfall climbing in snowshoes was fun… glad we didn’t have to do much of it though. This was one of the very few spots that had anything blocking the trail. Everything looked like it was in great shape. It’ll be interesting to see if it still looks that good when the snow is all gone. There were a few steep sections that we got to “ski” down. It was hard to imagine waist-deep snow after all the warm temperatures but there it was. The look offs were spectacular. Bright sun, no summer foliage and patches of snow as far as you could see. It was weird to snowshoe on bare ground but it wasn’t worth the effort of taking them off. There were a half a dozen sections like this, all no more than five to ten feet in length. Lots of short ups and downs. This was one of our hardest hikes in a long time. It’s amazing how much effort is expended post-holing through heavy granular snow. But that’s what you get wearing snowshoes at +10°C. We appreciated each short break. An overly caffeinated woodpecker-ravaged tree. Another of the steep descents… this one is more open than most. We’d hoped that some of the snow would be melted by the time we got back to the rail trail. No such luck, though we were able to stow the snowshoes for the walk back to the car. This was a tough slog for sure, but it was a beautiful day and a great opportunity to see the trail under very different conditions. We’ll be back to walk the whole trail and spend some more time in the wilderness area once things dry out.